→Scarcity Marketing: What is it? How does it increase conversion? If you’ve been online for a while now, chances are that you’ve pulled out your wallet a couple of times to grab some items for fear of not having them in the next couple of days. The fact is, you actually got caught by the power of Scarcity Marketing. Today, I found an Infographic by the guys at ThriveThemes so I wanted to share with you. It shows some of the most fascinating instances from the past where the scarcity principle played a major role in the outcome of events, either purposefully or accidentally. Scarcity Marketing for bloggers and affiliate marketers! You may think you’re just a blogger and affiliate marketer without a product of your own. Scarcity Marketing is therefore of no use to you. If you don’t have a service or eCommerce shop of your own, you can still take advantage of this marketing technique to promote affiliate products and increase sales. Oh Yes! The products ain’t yours so how do you apply scarcity to something you absolutely don’t control? One of the ways to boost your affiliate marketing is to add your own bonuses to the product you promote. If for instance you are promoting Thrive Content Builder as an affiliate, you may want to give out something different to your readers who use your affiliate link to buy. That’s where scarcity marketing comes in. Tell your readers if they buy TCB using your link this summer, they get this or that product from you worth $500. That should only be available this month. You have to make sure the bonuses you offer must be of huge value. People sometimes buy the product you promote just to access your bonuses. How do I get these bonuses Enstine? You see that you can still own a product even without any product creation knowledge. What if you only offer services? No products to sell! You can still make use of scarcity marketing. You can bring down your prices during some events and limit the number of seats available at that reduced price. You see, anyone can take advantage of this unbeatable sales strategy and boost conversion any time. If you like this post, please share it on social media. I’ll also like us to discuss about it and the old scarcity marketing technique. Please drop a comment below. Visiting you blog after a long time and found some interesting content. This is the first time I am hearing about scarcity marketing and i really liked the infographic you have shared. Robin Khokhar recently posted…How to find long tail keywords? Good to see you here again. I hope it’s been well with you! We always want what we can’t have it seems. And as marketers its important to take advantage of this fact. Haroun recently posted…Have you ever wished a master Forex trader would hand you the same secret strategies he uses to haul in boatloads of cash consistently for zero cost so you could do the same or even better? I used this,strategy a few times when I was in network marketing. It definitely piques interest and a push to buy whatever products or services you’re promoting. We always want something that we can’t have and that’s the beauty of this strategy when used right! 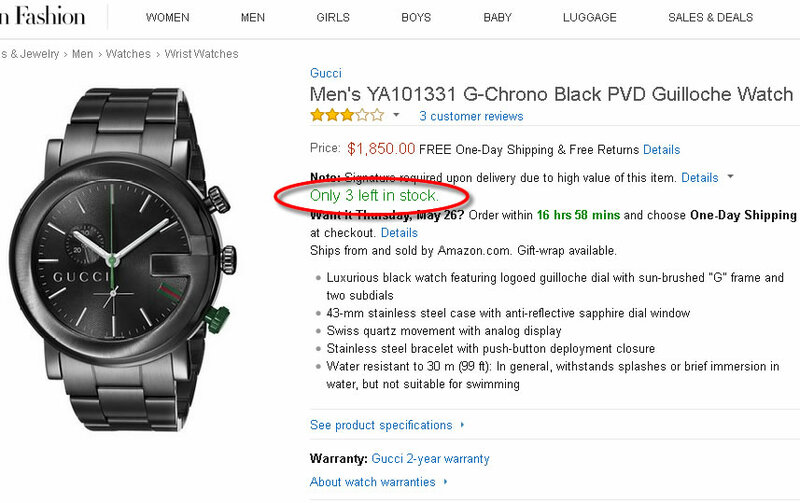 Introducing scarcity into your offers always helps sell them. I was shopping in the grocery store the other day and the manager got on the loud speaker and announced “fantastic price on all freshly baked bread, only at the baker’s counter, and only for the next 15 minutes”. People literally RAN to the baker’s counter to score the big deal. I can pretty much guarantee that if the manager announced the same great price would last for a week, almost nobody would have gone over to the counter until they “got around to it”, maybe today, tomorrow… and for many people it would have just been forgotten altogether. Scarcity absolutely increases conversion and you’ve given lots of good advice of how to use that to your advantage as an internet marketers. Hahaha that’s the power of this strategy. There is always a rush for something that will soon run out of stock. Great advice here, and great examples too. The way you have broken down the subject matter proves to me that you know what you are talking about and I think you are absolutely correct. People tend to buy more immediatley when they feel a sense of urgency, but also, to create this urgency you have to show that the product or service you are trying to offer will create value in the buyer’s life. I think when people think they will be missing out on something valubale creates even more of a sense of urgency mentioned. Thanks for sharing, I will definitely used these techniques in the future! If the value is brought out, the scarcity technique will work more. Hi Enstine, great tips. Loved the infographic you shared to make your point. It’s true, you see it all the time. One day only sales, only 2 left. I just shopped online this a.m. and every item showed only 3 left or 2 left. Of course I had to add them to the shopping cart before they were gone in my size, right? I will be using this tactic for my next eBook. Thanks for sharing the examples here with us Enstine and have a great day. When is it launching ? Are you selling on clickbank? Recently I am focusing on sales conversion and studying about a lot of information online about how to understand the buyer personal to get more sales conversions on my blog. Till now I have not taken any measures to improve the sales conversions on my blog article, this scarcity marketing looks interesting but I have to think how can I use this technique for my affiliate articles, thanks for sharing such a valuable information, see you soon with another article. I discussed a bit in this post how to use it for affiliate marketing. so Scarcity isn’t jut about time running out or the availability of a certain product. According to the infographic its also about being denied access to something. So if someone says you can’t have something the urge to acquire it is increased? Which spot on the infographic are you pointing at ? 1) Adam and Eve were told not to eat the apple so there were probably lots of apples but being told not to eat it was what created the desire. 2) Romeo and Juliet’s relationship was also forbidden. 3) In regards to the potatoes it was the guards around the potatoes that caused the interest in the potatoes and not any “scarcity’ factor. To me scarcity is when you’re told by a salesman that you have to buy it now because he can’t hold that price for long. Or when you log onto a website and it has a timer counting down with the knowledge that once it runs out so does the special deal. After a lot of many days I am seeing such a detailed graphics. These marketing tactics is great for product based affiliate system . They can show like “Offer only for first 10 people” Or Offer available for just 6 hours. I was also thinking how can I use this technique without having a product of my own. But the idea of packaging an affiliate product seems really effective. Thank you so much for sharing the infographic as well as how to leverage the benefits of scarcity marketing. Thanks for this cool infographics. Sure, this will increase sales and exposure. Thanks for revealing this secret!!! Yep – scarcity sells. Your infographic proves that point in a very graphical way. IM product launches always have a deadline, and then the ‘doors will close forever’. We all know it’s bunkum but fall for it anyway! Adding bonuses to an offer – whether an affiliate or own product offer – certainly works. I usually get a flurry of sales just before I withdraw the bonuses. Bottom line – people hate to miss out – look at the post-Xmas sales in department stores for more proof. Hahaha! that’s human nature and smart marketers are using it for their benefits. Who wants to be left behind? Everyone who is able wants that piece of hot cake at the cheapest price possible. That’s what explains the mad rush during price break down. Hi Muki , Thanks for sharing such a informative blog just loved it dude . Got some thing new . An appreciation for your blog . Excellent Post, Infographics are superb! Scarcity still works, it is a good way to convert visitors into buyers. Thanks for this detailed one and very informative. Sure, this will increase sales and exposure.Thanks for revealing this secret trick. What a great concept. People will always rush for products that are scarce. As you shared, scarcity is perceived as a big value. Hi Enstine. I agree that using scarcity can really help your sales if you do it right. It can also bite you hard when it is fake and your readers figure it out. If you offer a bonus or a discounted price for a period of time, it needs to end after that period of time. I’ve been to many website that offer that kind of thing and they have a timer on their website. Maybe it’s good for three days. I delete my cookies every day from my browser. When I re-visit the website again the next day, or three days later, the offer is still there and it’s still good for 3 days. The illusion of scarcity is gone, and so is their credibility. It can work, but it has to be real scarcity. A great post. Very informative.This is the first time I am hearing about scarcity marketing and I really liked the infographic you have shared.